On the day of the descent of the Holy Spirit upon the apostles, the holy Church brings us to the threshold of its grace-filled life. “May all humanity be silent…” There is something greater here. There is something here which the human mind cannot comprehend, accept, or encompass within its narrow limits. The last great sacrifice has been offered. The feat of sacrificial love has revealed to the world the boundless expanses of Fatherly goodwill. “Ye are my friends… Henceforth I call you not servants, for the servant knoweth not what his lord doeth; but I have called you friends, for all things that I have heard of My Father I have made known unto you,” – said the Lord in His farewell talk with His disciples (John 15:14-15). And further: “I have yet many things to say unto you, but ye cannot bear them now; howbeit, when He, the Spirit of Truth, is come, He will guide you into all truth” (John 16:12-13). And now this day of the coming of the Spirit of Truth, the day of the Divine Comforter’s meeting with the human soul that is hungering and thirsting for comfort, is triumphantly celebrated by the holy Church. The apostles were in a chamber on Mount Zion… “And there came a sound as of a rushing mighty wind,” testifies the church canticle. 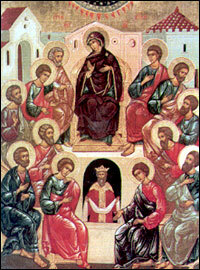 The Spirit of Truth and Divine Comfort descended upon the heads of Christ’s disciples in the form of fiery tongues. The human soul, which is Christian by nature, finally found that source of living water for which it yearned, to which it aspired, and which it had been unable to find. “Come and dwell in us, and cleanse us of all impurity,” – became the prayer of the liberated soul. “The acquisition of God’s Holy Spirit” – such, in the definition of St. Seraphim of Sarov, is the ideal of a Christian’s life on earth. Prayer, vigilance, fasting, charity – all of these are only means toward acquiring the divine fullness of existence, toward preparing the soul to meet the Comforter. But there are too many barriers between us and the spiritual world, brethren, not only to acquire, but sometimes just to experience the joy of holiness. The world has become steeped in vanity… It has given itself over too much to worldly joys and sorrows, which have smothered the words of eternal life in it. And thus on the day of the descent of the Holy Spirit upon the apostles, the holy Church reminds us of the comfort that we have forgotten, summons us to aspire toward the wealth of spirit that we have lost, to understand the world and all its falsehood. It calls us to aspire toward God and His truth. Beyond the bounds of our ordinary world we see opening up before us a world of Christ’s grace. The path between these two worlds is difficult and thorny. But only there, in the realm of Christ’s grace, lies the true homeland of each one of us. O Lord, Who didst send down Thy Most-holy Spirit at the third hour upon Thine apostles, take Him not from us, O Good One, but renew Him in us who pray unto Thee.